Out of the Silence is a storytelling performance by Simon Heywood and Shonaleigh Cumbers, drawing on first hand accounts of the lives of the conscientious objectors of the First World War and bringing their experiences to life in a moving, compassionate, sometimes humorous, always heartfelt and ultimately life-affirming account of the hardships and trials of the men who refused to fight, while at the same time linking their experience with the origins of the modern peace movement in the UK and their relevance to us today. West Lane Baptist Church, Haworth, BD22 8EN In 1916, as soldiers died and volunteers grew scarce, the British government began the first ever mass conscription of its own citizens. Of millions called up, sixteen thousand claimed the new right to conscientious objection, so many that the state didn’t know what to do with them. As their world collapsed, the “conchies” embarked on a long, lonely and silent war against war itself. They suffered ridicule, torture and imprisonment. Their stand split families and communities. They played cat-and-mouse with the state. 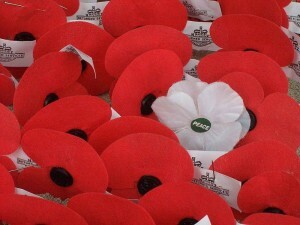 Some were forced to the front; others went willingly, or toiled on the home front; a thousand refused, and went to jail. Some went mad; some died. Many survived the war to embark on lives of public service. We reap the benefits of this legacy today. Their memory has been neglected, and they are still dismissed as cranks. But every objector had to learn to account for his choices, and tell his own story. 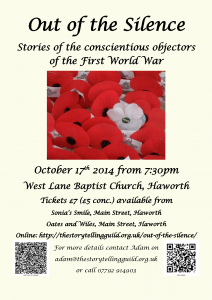 Drawing on first-hand accounts, letters, diaries and memoirs, storyteller and former peaceworker Simon Heywood brings the voices of the conscientious objectors out of the silence, with original songs composed and sung by Shonaleigh. 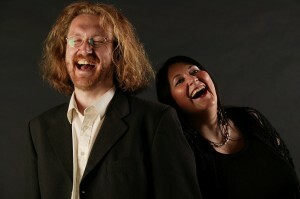 and creative writing at Derby University, and has published poetry, fiction and non-fiction. He shared Best Documentary Award at the 2005 Strasbourg Film Festival for Contempt of Conscience. He shared Best Collaboration Award with Tim Ralphs at the 2012 BASE Awards. He is author of The Legend of Vortigern (2012) and South Yorkshire Folk Tales (due autumn 2015). He works as a writer, storyteller, and musician. He has also worked as a campaigner for Quaker Peace and Social Witness and at Conscience: Taxes for Peace Not War. He co-wrote the peacepays.org website showcasing alternatives to conventional military expenditure. Shonaleigh is a drut’syla (storyteller) from Yiddish oral tradition. She has worked as a storyteller within the secular world for the past 17 years across the UK, Europe and United States. UK deputy national Storytelling Laureate 2010-12 she used the opportunity to promote and work with inner city communities devising oral literacy programmes for schools and adult education. She was shortlisted for the Arts Foundation Award in 2009. She performs from the Barbican to Burgreave Village Hall, from the Albert Hall to Albert Park, Unstone, and all points in between. Her commissioned pieces include “The Tower Of Bagel,” the first commission from Festival at the Edge in 1998, and now available as a CD for the first time; “Fool of the Warsaw Ghetto;” “The Ruby Tree;” “The Golem;” “The Golden Labyrinth;” and her work with storyteller Peter Chand, of which she is very proud. She has completed commissions for the British Library, the British Museum and Hay-on-Wye Literature Festival to name a few, and is a regular contributor to BBC arts programmes. In April 2012 she was appointed Artistic Director of Phrase Arts , with a remit to promote and support story within communities and this has led to work with the European Court of Human Rights – a very exciting dimension to her work. But of all the stories she tells she believes its is those that are told between family and community that are the most important and valuable.